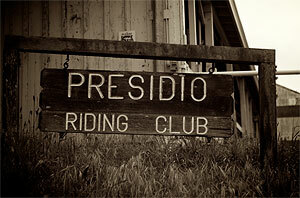 The Presidio Riding Club, or PRC, is a partner of Golden Gate National Parks, a unit of the National Park Service, and is a 501(c)3 nonprofit cooperative organization governed by a Board of Directors, elected by the members, and all members are active in assisting with the affairs and upkeep of the facilities. With its rich history being part of Fort Barry and Fort Cronkhite and now part of the Golden Gate National Recreation Area (GGNRA), the land is also home to unique military and historical architecture. The oldest building at the Presidio Riding Club is the 1921 Mirage Balloon Hangar. This historic structure is only one of two still standing in the United States. The only other remaining balloon hangar has been converted into a theater. The other buildings at the PRC were built during World War II and housed a motor pool. 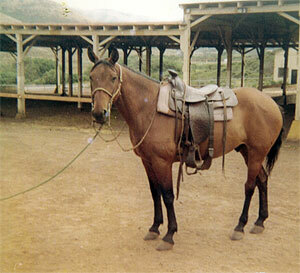 The U.S. Army transformed the facility into a stable for military horses back in 1966. Park police have also stabled horses here in the past. The history of horse stables in the Marin Headlands dates back to 1902, when a Quartermaster stable was built to house 35 military horses at Fort Barry. In 1995, the National Park Service took over the military lands of the Presidio. Per National Park Service regulations, the PRC is not permitted to do public trail rides or lessons. We do operate a Horse Hotel that is open to the public, and we invite you to bring your horse for an unforgettable stay riding the trails of the GGNRA. If you are interested in getting more information on the Presidio Riding Club, would like to become a member and be put on the waiting list to bring in a horse, please check out our FAQs. 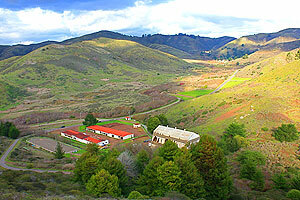 The Fort Barry Balloon Hangar is one of many cultural resources within the Forts Baker, Barry and Cronkhite Historic District located within the Marin Headlands. The Fort Barry hangar complex (consisting of the Balloon Hangar and the sheds/stables) is an extremely significant historical area. The 1973 National Register of Historic Places lists the Fort Barry Balloon Hangar as a contributing feature to the Forts Baker, Barry and Cronkhite Historic District and the complex’s three buildings are also contributing elements to a potential National Historic Landmark district on the Harbor Defenses of San Francisco. 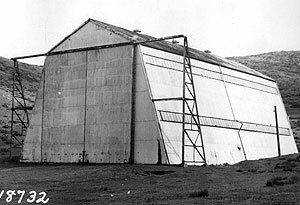 The Balloon Hangar (Bldg FA-905) is a rare surviving element of the US Army’s brief experimentation with using tethered balloons as part of the nation’s system of coastal defenses. Constructed and abandoned the same year, the structure is the only surviving hangar of its type that actually housed an army observation balloon. As such, it has a national level of significance for its part in the evolving stories of both coastal defense and military aviation. The Fort Barry Balloon Hangar has had various uses and modifications, but still maintains a high degree of integrity, retaining significant characteristics from all of its three defensive roles: first, as an Air Service facility that aided in the coastal defense system and experimentation from 1920-1921; second, as a WWII motor pool site that supported the Harbor Defenses of San Francisco from 1940-1945; and finally, as a Cold War anti-aircraft and missile maintenance facility from 1953-1959+. The Fort Barry Balloon Hangar is the only example of an airship hangar that retains its important interior configuration in an unaltered state. The basic gambrel-roof design and dimensions of the original hangar remain unchanged, and its interior layout still retains the open, airy feeling of an aircraft hangar. 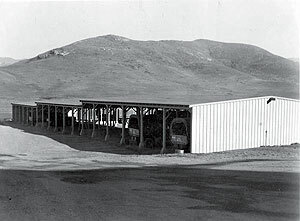 The current horse stable buildings (Bldg 901 & 902) are rare examples of “Series 700” design structures erected by the army on the eve of WWII and were originally built as vehicle sheds, as the Army converted the hangar area to a motorpool area. Series 700 vehicle sheds were once common at Bay Area military posts, but all have been demolished except for this pair. 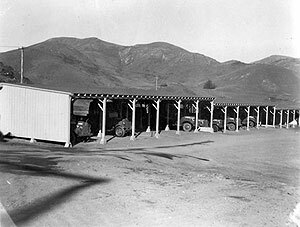 From 1940 onward, they served as a motor pool facility for the Coast Artillery and Air Defense Artillery, making these structures important elements of the story of the defense of San Francisco Bay during WWII and the Korean War. During the Cold War, the sheds continued as vehicle storage for the Air Defense Units and Nike sites in Marin Headlands. Even though altered by enclosing most of their originally open bays, the sheds’ exterior dimensions and rooflines remain in their original configuration, with certain sections of Bldg 902 remaining in its original open bay configuration, complete with bare earth floors. The National Park Service has made a commitment to preserving other Series 700 building examples remaining in Forts Baker, Barry, and Funston, and these functional structures contribute significantly to that preservation effort. 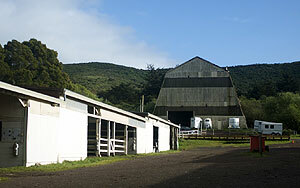 In 1966, the Presidio Riding Club Stables were created at the site of the former vehicle sheds and the Balloon Hangar building. The 1940s vehicle sheds were enclosed and turned into horse stalls and the hangar’s interior was converted into an indoor riding arena. The unique utilization of the structures as a horse stable by the Presidio Riding Club has allowed the facilities to be preserved very closely to their prior uses, allowing for a unique view into the past utilization of these buildings, and for the past 40+ years in their existence as a stable they have created their own ongoing history as well. 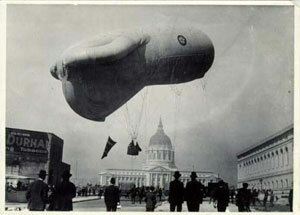 Fort Barry Balloon Hangar, 1939. East Vehicle Shed, Ft. Barry, 1940. West Vehicle Shed, Ft. Barry, 1942.